Bicondylar/Schatzker 6 type tibial plateau fractures are a significant challenge to the trauma and orthopaedic surgeon. These injuries tend to be complex, high energy and are activated with significant morbidity. Two surgical methods are commonly in use: (1) hybrid external fixation or (2) internal fixation. We performed a systematic analysis of papers comparing these two techniques. The Medline database was used and the MeSH terms associated with bicondylar/severe tibial plateau fractures were inserted. Forty-nine studies were retrieved but only five papers presented data to directly compare the two techniques as these studies actually compared the implants. Study designs and outcome measures were not consistent in all studies and therefore no direct comparison could be made between the papers. The first two studies were laboratory based and suggested that hybrid external fixation may have a benefit over internal fixation with respect to failure load and its use in compromised bone. Two further papers presented only type 4 evidence. The final paper was a multicentre randomised controlled trial and it demonstrated a marginal non-significant benefit of hybrid external fixation over internal fixation although there was suggestion of beta error [i.e. accepting the hypothesis when it is not true]. Bicondylar/Schatzker 6 type fractures are difficult to manage. The treatment of such fractures, need to pay specific attention to the soft tissue envelope around the knee. Hybrid external fixation has theoretical advantages in terms of the soft tissues but the benefit over internal fixation is modest at best and has not demonstrated improved outcome. 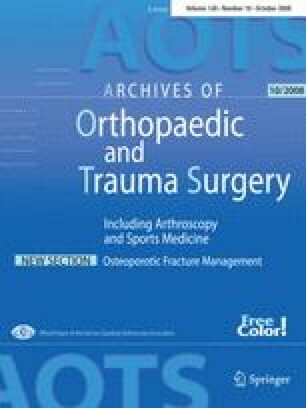 Newer fixed angle screw and plate systems are increasingly in use and need comparative studies to determine their role in this complex group of fractures.